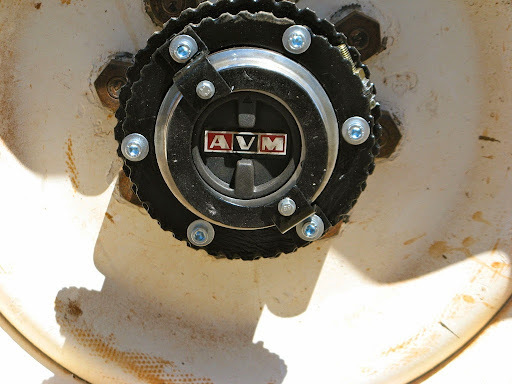 Many Oka owners have AVM freewheeling hubs and several (including me) have had on-going problems with them. 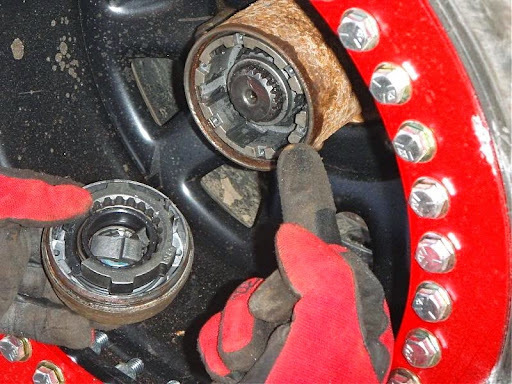 Several times a hub has broken such that they either won't engage or disengage 4wd, (they just click as the wheel rotates), twice the fixing screws have come loose and once the outer hub has fallen off and disappeared completely leaving us without a 4wd capability. 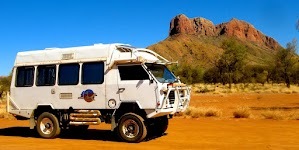 So I've analysed how they work and what can go wrong, and considered what can be done about it to ensure you have 4wd when needed on an outback trip and 2wd when you don't. Some of this information may also be relevant to Warn and other makes of hubs (eg Superwinch) which probably work on a similar principle. 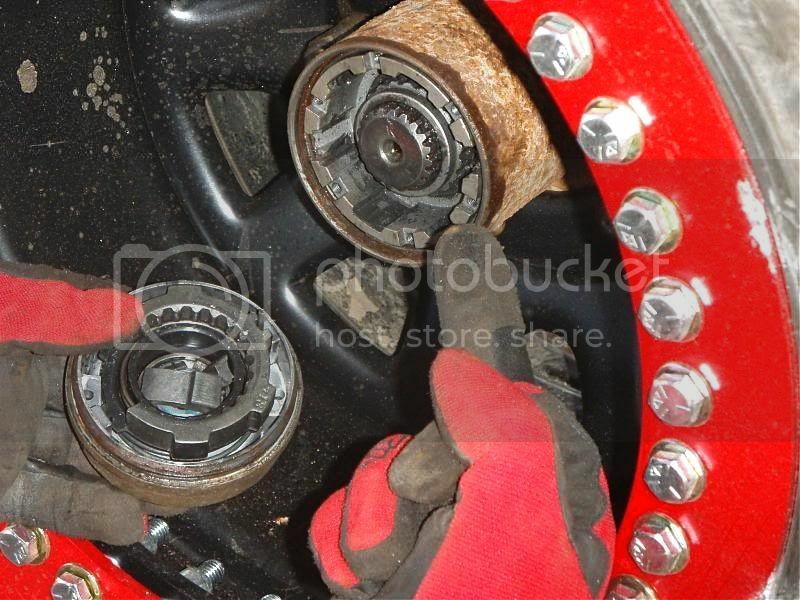 If you have SuperWinch Free Wheeling Hubs like this, you will probably also have the same problems. 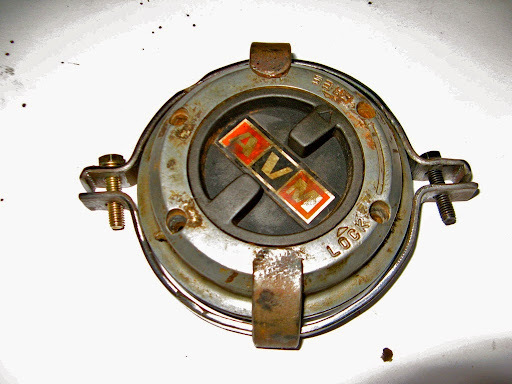 They look like rebadged AVM's and I know of one which is stamped with the same casting number, 439. The SuperWinch part number is 400439. The AVM hubs comprise 2 main assemblies, an outer bolt-on assembly which contains the Free/Lock controls and a sliding locking ring, and an inner gear which engages the internal hub splines and drives the hub round and also holds the splined drive shaft roughly central. The outer assembly comprises an aluminium outer frame, a plastic control lever, a grooved plastic cylinder, a large spring and a steel locking ring. It bolts on to the inner assembly via 6, 2 inch long countersunk socket head screws. 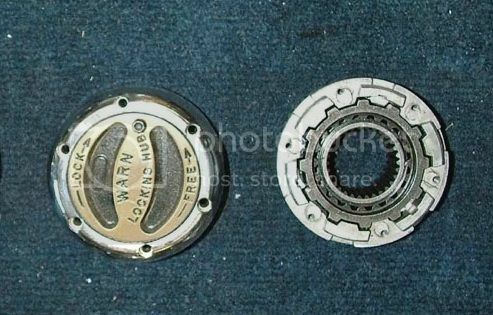 The locking ring is attached via a spiral spring to a plastic ring with 3 tangs on it to engage in the grooved cylinder and it's alignment is maintained by 2 thin roll pins inserted into the aluminium frame. The inner assembly comprise a solid steel ring casting with external splines held in by a large internal circlip inside the hub, plus a central spline gear which is free to rotate but is held into the larger ring by a rear circlip. 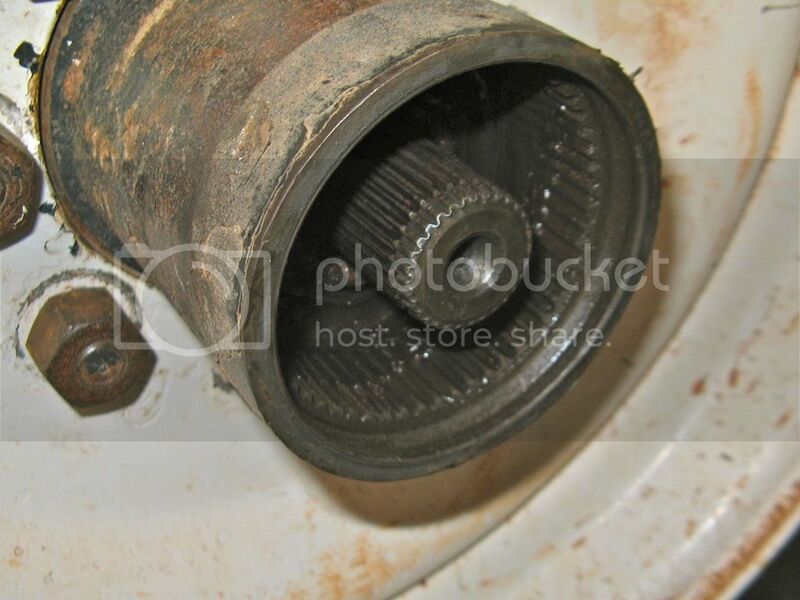 It is also held in by a circlip around the front of the central splined drive shaft. 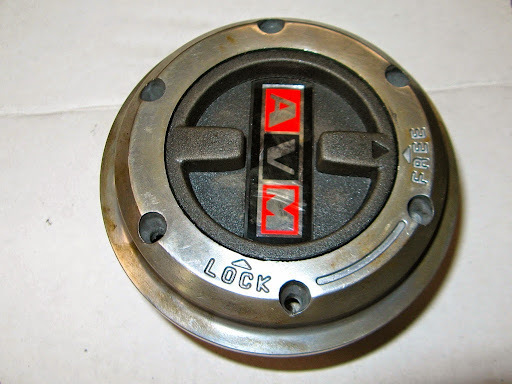 When the lever is moved to the Lock position, the cylinder is rotated by the control lever and the tangs on the locking ring slide down the grooves. 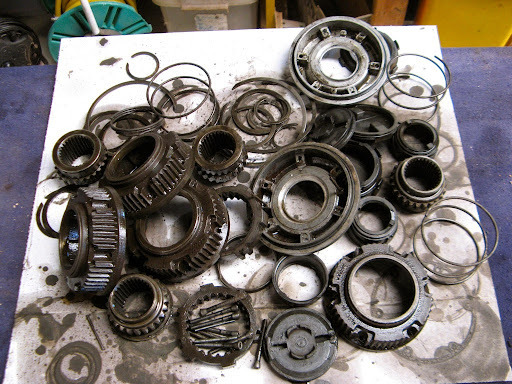 The spring expands pushing the locking ringing into the inner assembly, locking the splined central shaft to the outer hub by engaging the gear teeth and the ring of 6 rectangular cams. The natural or fault position of the control is the Locked position and turning the lever to the Free position actually pulls the locking ring away from the inner gear. Indents on the grooved cylinder hold it locked or unlocked. No maintenance is normally required, but if they are removed, cleaning the plastic surfaces and lightly oiling them will maintain smooth operation. 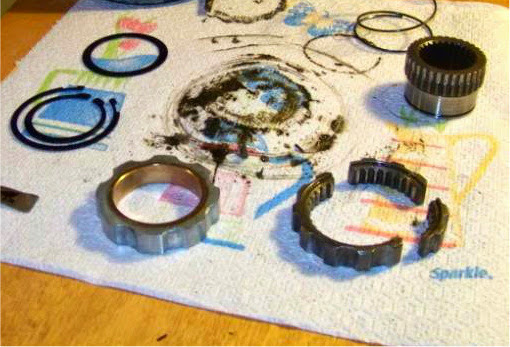 Also oil the central splined gear where it rotates continuously inside the back of inner assembly. The inner mechanical components of the AVM hubs are solid and strong I have never had a problem or concern with the mechanics of its operation. 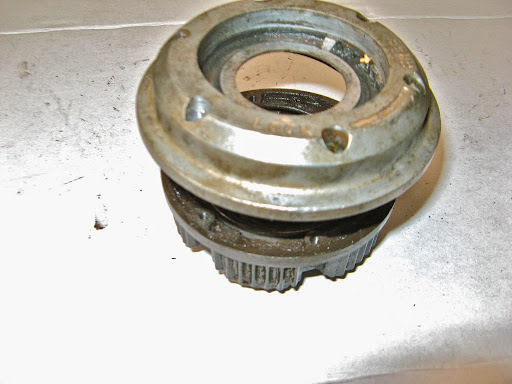 If anything there ever broke it would indicate something far more seriously wrong with the stub axle/spindle or bearings than the free wheeling hub. However anything can break and I have seen the equivalent locking ring broken on Superwinch and Warn hubs. 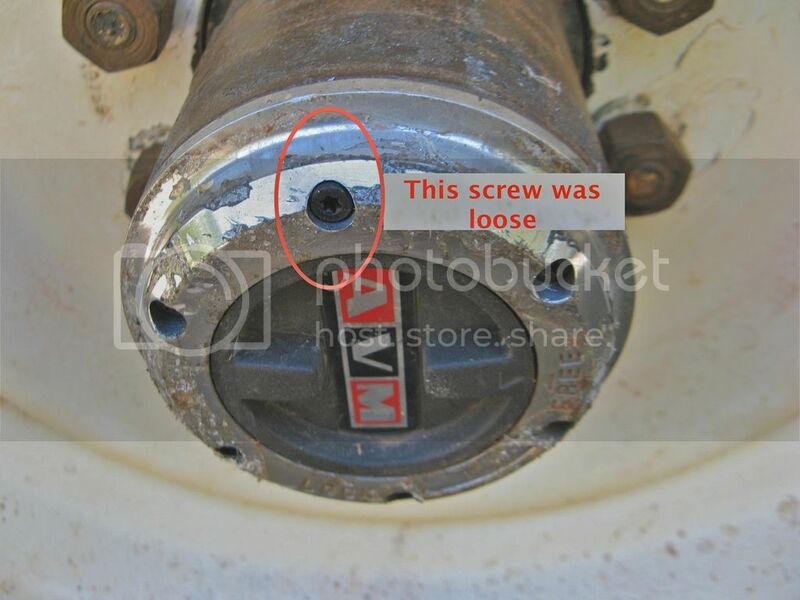 The outer assembly is held in by 6 long 8/32 UNC screws into the inner assembly and these screws can come loose, since they have no locking mechanism, potentially causing the outer assembly to fall off. Without outer assemblies fitted, the vehicle can only operate in 2 wheel drive as there is no locking ring to couple the splined shaft to the hub. [OK, with a diff lock, 3wd is theoretically possible]. The inner gear components are held in by 3 separate circlips so it's very unlikely they can come out in operation. They contain no plastic or weak components so it's a very strong mechanism. The plastic control components in the outer assembly however are weak and poorly designed and it is these that are most likely to cause a failure. In my experience the primary problem is the tangs on the plastic ring which either wear away or break off. 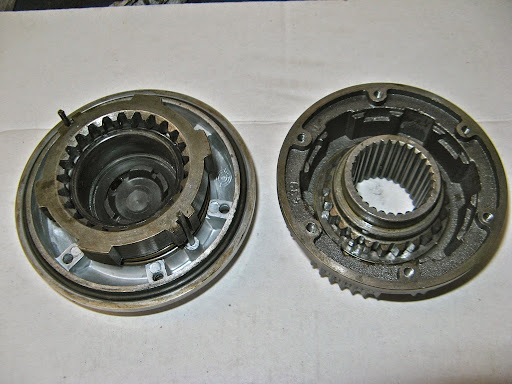 This leaves the hub either unable to engage or disengage 4WD, or, when one tang breaks off, the hub is left partly engaged and clicking as the wheel rotates. There is only a 90º turn in the control mechanism (unlike Warn's 325º) which puts a strain on the plastic tangs. 2 broken plastic rings. The top one is complete except for one broken tang. The lower one has all three tangs but the sides are shattered. The grooved cylinder can also wear so the indents no longer keep the hub in the selected position and/or the clips on the inside of the control lever fail to hold the grooved cylinder so that control is lost. The hub may then become locked, even though the lever looks like it's in the Free position. This is a "fail-safe" situation (ie 3 or 4wd) but can catch you out if you are not aware of it. Where this is suspected, I turn the front drive shaft by hand until I know what's engaged or not. 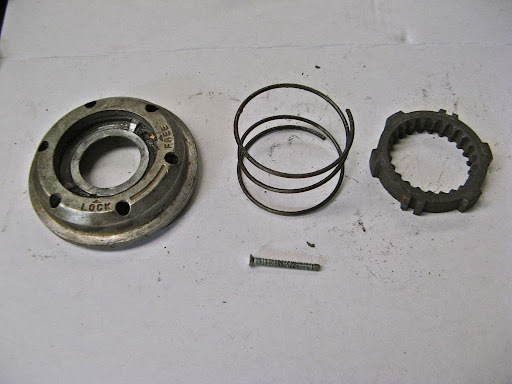 really the nylon pieces are the weakest of hub components and might last just 6/7 years in standard conditions of use . We do not sell internal components to avoid installation faults and safety problems. Therefore we commercialize just the service kit shown in the attached picture and the nylon cap dial. Anyway please contact our local distributor at broach@donkyatt.com.au and ask him if can import the complete nylon set ( 3 pieces) . In that case we will do an exception for you and supply it. I've contacted Don Kyatt and they are looking into the availability of spares components. 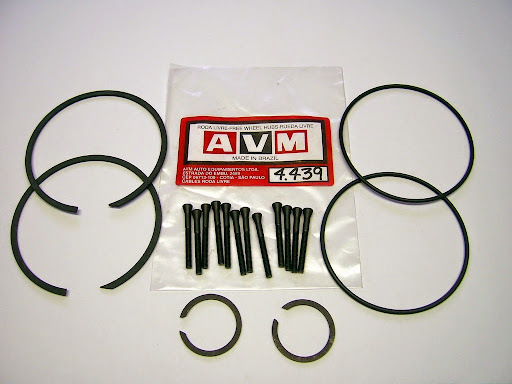 The "service" kit (AVM #4.439) comprises only 2 sets of replacement screws, large O-rings and circlips for the inner hub and splined shaft, which is pretty useless. 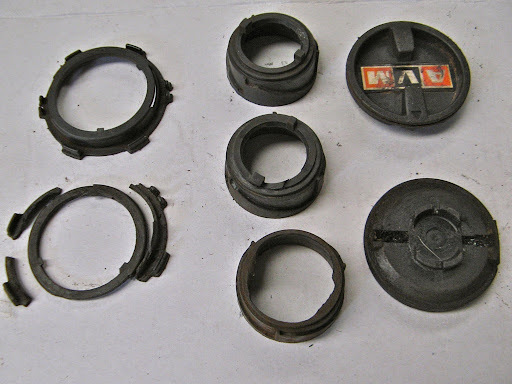 Although Warn is touted as a superior make, a brief search indicates there are cases of failures in their hubs too, but their problems seem to be mainly shattered locking rings rather than the control mechanism. 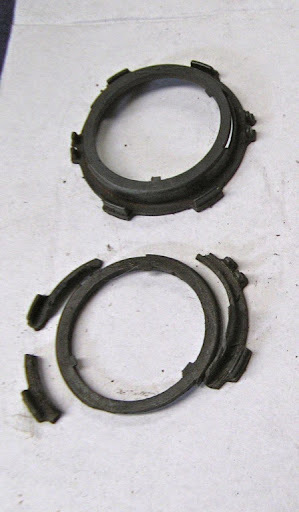 The Warn locking ring appears to be slightly thinner than the AVM equivalent but has more cams. 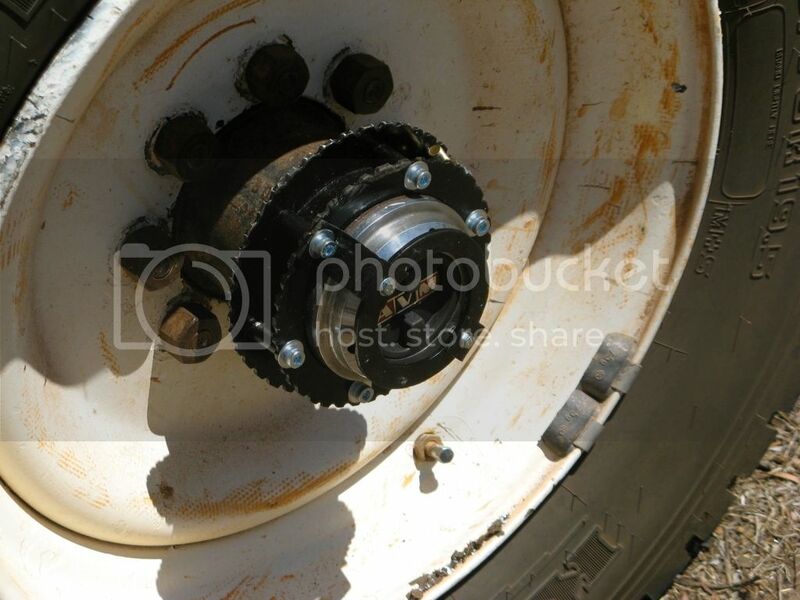 Firstly it is obviously preferable/essential that the the outer hub never falls off since it contains the all important locking ring, without which 4wd is not possible. (We were on a bitumen road to Melbourne when ours disappeared so it can happen at any time). The outer hub is fixed by 6 screws which are 2 inch long (possibly 8/32 UNC) countersunk socket headed and deeply recessed into the aluminium frame. If they are over tightened or Loctited to avoid them loosening they can be very difficult to remove and I've had to drill several out. The heads are either small Allen sockets, which round off very easily, or Torx sockets which are easier to remove. [Note: to remove a stubborn or rounded Allen head screw, you can hammer an equivalent sized Torx driver into the Allen socket to improve the grip, the sharp points cut their own shape. 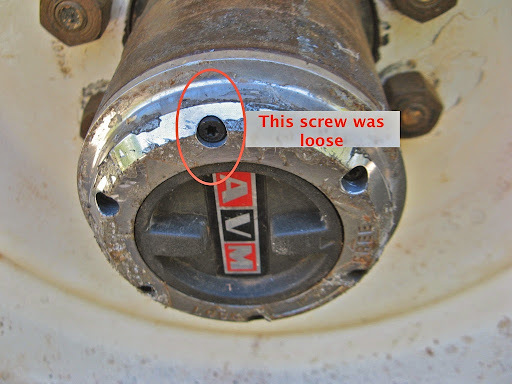 If you must reuse a damaged screw, cut a slot in the head first so a flat bladed screwdriver can be used for later removal]. Loctite the long fixing screws. This will work but makes their removal potentially difficult and might mean drilling them out. Put tape over the heads of the screws so they can't come out, or if they try too it's easier to spot. After removing the tape 9,000 km later, 2 screws were loose and this one would have fallen out, but for the tape holding them in. Fill in the holes above the heads of the screws with silastic. This will work but it's also potentially difficult to remove. Drill and re-tap the screw holes on the inner gear and aluminium frame to allow larger bolts and lock washers to be used with bigger Hex or Allen heads that you can actually get a spanner on. A short spacer will also be required to fill the countersink bore. Two larger bolts would probably suffice to retain the hub and M5 is probably the largest bolt size that could be fitted. M6 might exceed the space available and interfere with the internal circlip. These bolts could then be Loctited successfully since removing them is mechanically easier. This is probably most effective but invasive solution and doesn't affect wheel removal. Bolt a strip of steel/aluminium across the front of the aluminium frame to prevent it from falling off, and secure the strip on to the hub steps, if fitted, or to the hub using a large hose clip or even a large tie-wrap. However this might impede operation of the control lever. 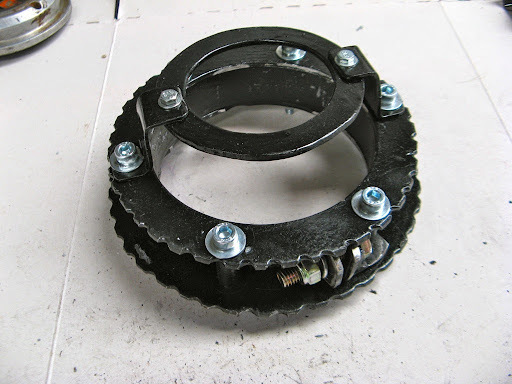 Fabricate a steel ring clamped to the hub (or use the step ring where fitted), with 2 or more claws welded around it which fit out and over the hub screws to retain them and the outer assembly. The claws will not impede access to the control lever and the ring can double as a non-slip step ring. A thin flat ring could be welded to the ends of the claws to retain all the screws and avoid them catching on passing flora. I'm implementing this concept and incorporating hub steps. In this design the clamp ring is a 2mm x 25mm steel band but the steps are 3mm aluminium plate because it's easier to work with and lighter. 3 steps rings could be used á la Oka, but I'm not sure the inner ring is very useful. The step rings are clamped either side of the steel clamp band by long bolts and spacers so they can't move laterally. A small bracket secures the rings to the clamp band bolt so they can't rotate. a few of the long screws. 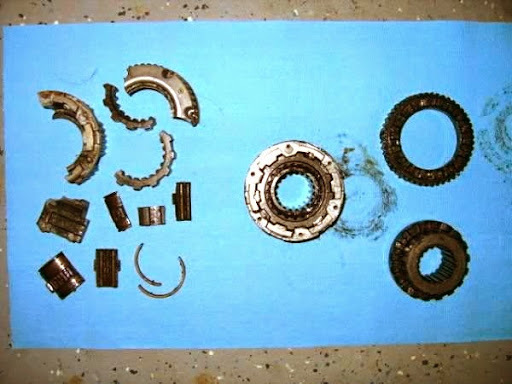 These items can be recovered from previously failed hubs and/or are not heavy items to carry as spares. 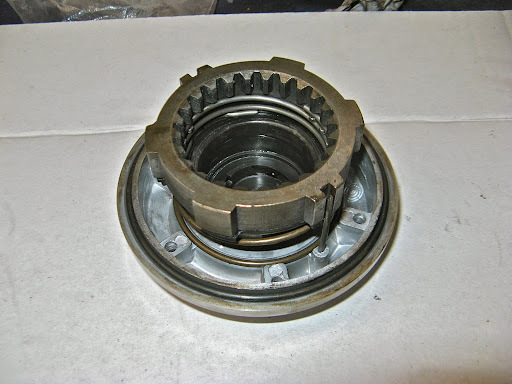 To lock the hub into 4wd, insert the locking ring, bevelled edge first, into the inner hub gear and bolt the aluminium frame on to the hub, compressing the large spring between them. Only a minimum of 2 or 3 screws are required to hold the outer frame on since there's not a huge force against it, and in 4wd, all the hub components rotate together. Put some tape over the screw heads so they can't come loose. This can be done in a few minutes since no wheel removal or jacking is required, and the centre hole on the frame can be covered by sticky tape to keep dust out. Just a locking ring alone would suffice if you could engineer a way of holding it into the hub, eg screwing a plate or strip across the hub securing it with the long fixing screws, but if you've got a locking ring, you've probably also got an aluminium frame. To revert to 2wd, remove the locking ring and spring and replace the aluminium frame. What other precautions can be taken? 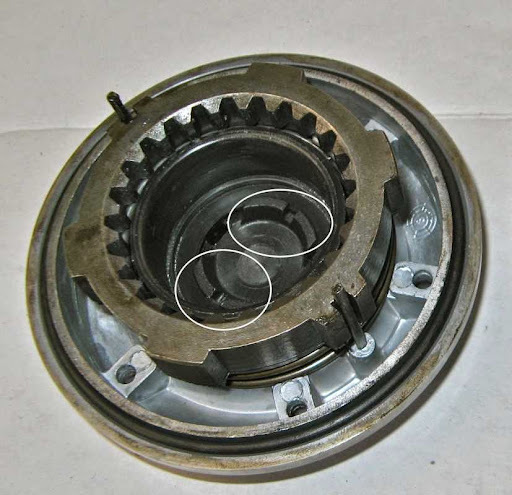 The inner assembly is held in place by a large circlip which sits in a lipped groove in the hub, behind which is a bevelled edge prior to the internal splines. It is therefore possible and desirable to fit 2 circlips. The reason is as follows. 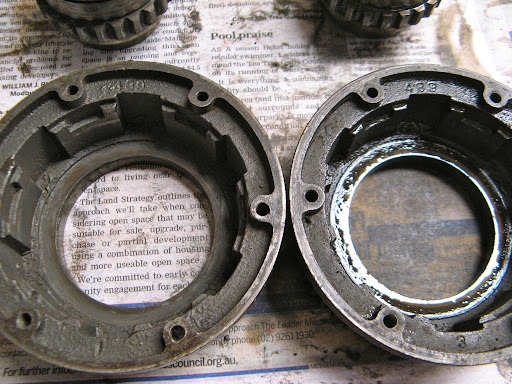 The locking ring begins to engage the inner gear when the spacing from the outer hub face to the inner gear face is about 6mm. This very close to the normal unlocked separation of the inner gear and locking ring, which is why a single broken tang can cause clicking. The long screws actually draw these faces together when tightened and anything that can increase the spacing minimises this problem. Fitting 2 circlips will achieve this. It has been also suggested that the length of the splined shaft gear or location of the circlip groove can affect operation of the hub, but in my case, I could not see any way that the gear or shaft could impact the plastic components. The drive shaft position is controlled by the thrust surface on the rear of the wheel hub and the ends of the splines remain about 10mm from the control components. Of course replacement or other makes of drive shaft may have different lengths and the circlip maybe in different locations along the shaft. If the central spline gear seems to be too long, don't fit the circlip on the splined shaft, it can't go far and the gear should still be held to the inner assembly by a rear circlip. Others have machined the gear shorter to allow fitting of the circlip but that depends on the length of the drive shaft which I assume might vary between makes. I have had around 3 or 4 failures of AVM hubs, all resulting from broken plastic parts, plus one lost outer assembly caused by screws working loose, and twice I've had to buy replacement sets. So I now have a stash of spare parts which can be re-assembled into useable spares. spare plastic components (if AVM/Don Kyatt come good). 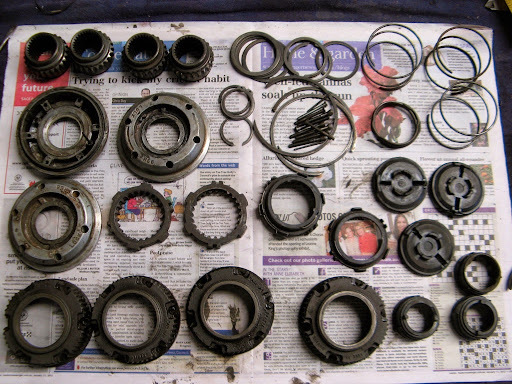 If you need or want to disassemble/reassemble the outer hub there are few things to be aware of. To remove the control lever, use a round bar (I used a socket extension bar) held against the inside of the lever with the outer part of the cover resting on the open jaws of a vice or similar (wider than the control lever diameter), and give it a sharp tap. It should pop out and all the components can then be removed from the inside. (Note it's probably a good idea to oil the plastic parts on inside of the control lever a bit first so they disassemble smoothly). Remember the order in which the plastic parts, springs and locking ring come out. The guide roll pins can be removed by pulling them out if they get in the way. 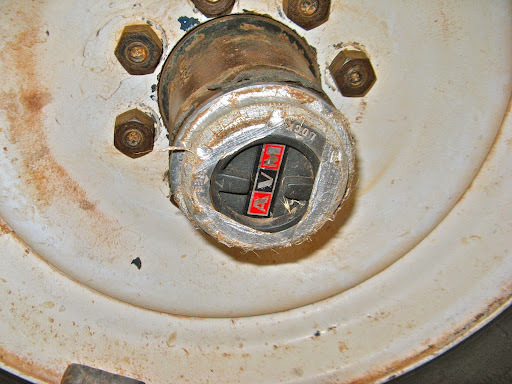 To reassemble the outer hub, note that the control lever has 2 slots on the rear which engage the 2 tabs protruding from the grooved cylinder. These tabs are not the same width and must be oriented correctly so the Lock/Free positions line up. Refer to the photo of plastic items above. Also the grooved cylinder can be oriented in 3 different positions on the tangs on the sliding component (with the spring and locking ring attached) so ensure that it is correctly aligned so that when engaged with the operating lever, the Lock/Free positions are correct. When the components are correctly aligned, holding them all compressed on to a solid surface, use a socket which will just fit inside the cylinder and tap it to engage the control lever clips. If one tap is not enough, check the alignment of the control lever with the grooved cylinder tabs. Reinsert the guide pins and check the operation of the control lever. Note, each time this operation is done, or if the parts are not aligned properly, there is a risk of the plastic edges breaking away, eventually causing them to fail, so don't do this too often. 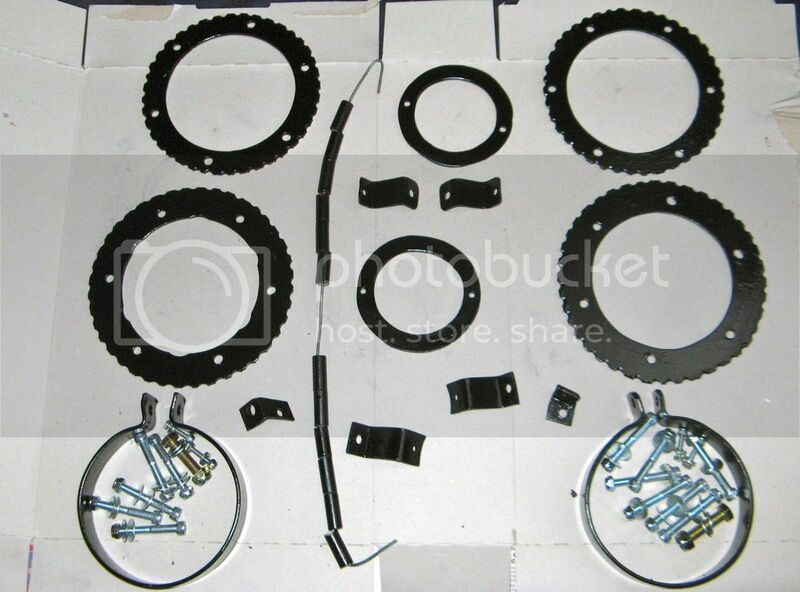 I have successfully done this a few times, to construct a working outer hub from components from several failed hubs but they are not designed to be disassembled. Oil the plastic parts lightly to minimise wear and allow them to slide smoothly. When rebuilding a spare inner hub, I observed that there are difference in the design of the outer ring. Both types are marked 439, which is the AVM part number for a hub to suit a Dana 60 internal mounting and 30 spline shafts. Note the opening (not the spine gear) in the rear of the inner ring on the left is larger than the one on the right. 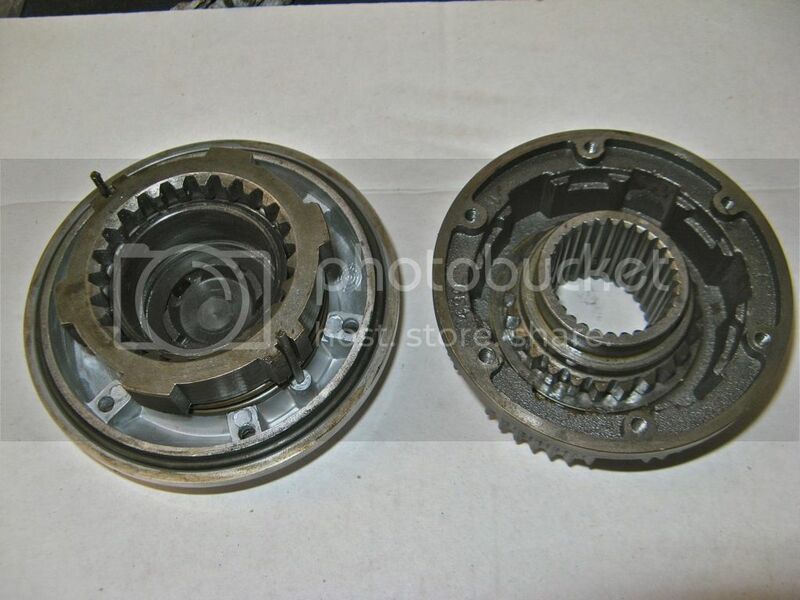 The inside diameter of the left hand gear is 50mm whereas the right hand one is only 49mm. 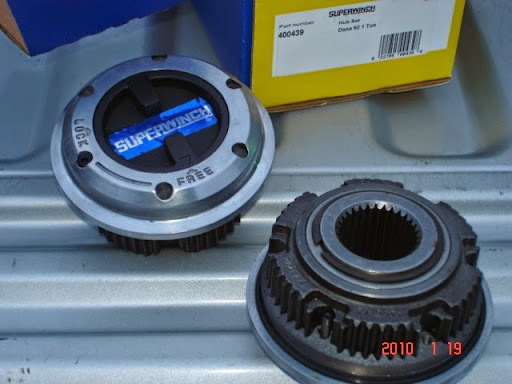 Although it doesn't sound much, the inside surface of the outer ring, which rotates continuously with the wheel, is what supports the splined gear, which is stationary in 2wd, and 1mm can make a difference. 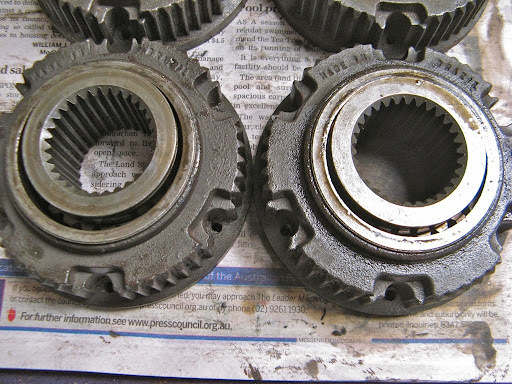 On the larger ring, the spline gear almost falls through the hole. I suspect the larger ones are early models since all our later models have been the 49mm size. Both rings are stamped "439"
For reference, AVM also make a similar hub for 35 spline shafts, model 439K, which is the model recommended for the Oka NT and is listed in their catalog. The 30 spline model 439 is listed under Ford F350, Dana 60. The only difference between the 30 and 35 spline models is the central splined gear. David, a very comprehensive article thank you.